Lot 40. Sicily, Syracuse. Roman Administration. After 212 B.C. Æ (19 mm, 8.17 g, 12 h). 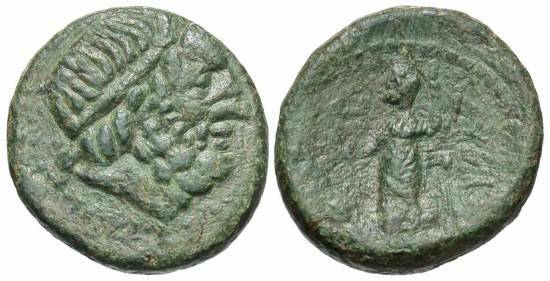 Head of Serapis right / [ΣYPAKOΣIΩN], Isis standing facing, head left, holding sistrum and scepter. CNS II, 239; HGC 2, 1473. Green patina. Very fine.